Franky, we think Cartoon Books put this announcement best. We’ll just pass it along to you: “25 years after the first black & white issue of the self-published comic book BONE appeared on comic shop shelves, and over a decade since the concluding chapter comes a new (and completely superfluous!) adventure featuring the Bone cousins! Ride along with the boys and their friend Bartleby the Rat Creature as they brave the dangerous journey across the desert back toward Boneville in their rickety cow cart. 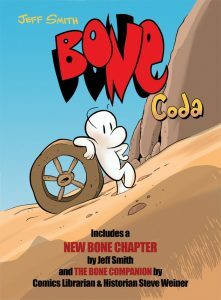 Creator Jeff Smith is back for another laugh with Fone Bone, Phoney Bone and Smiley! Also included is the complete text of The BONE Companion fully illustrated for the first time! It’s written by award winning comics historian Stephen Weiner. All this plus rare behind the scenes photos & memories, and an afterword by the author thanking the comics community and the readers all add up to make this a truly special commemorative volume of BONE to add to your collection!” As with any work in the Bone universe, there are lots of not-human characters to be seen here. Want to see it for yourself? Find out more over at Comics Alliance.